Portree athlete Hugh Campbell is to run this year’s Skye Half Marathon in aid of Alzheimer Scotland and in memory of his gran, who passed away in February having suffered from vascular dementia. Hugh’s grandmother Joan McGill was diagnosed with the disease when he was 19. Sadly, this meant that because of the effects of the illness Hugh was never able to share with his gran his passion for running or his achievements in the sport. These include becoming the first man from the island ever to win the Skye Half Marathon and a 34th place finish at the world’s largest half marathon, the Great North Run. 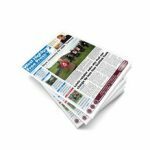 Having experienced at close quarters the effects of dementia, and keen to raise awareness about the disease, Hugh — who is now 32 — spoke to the Free Press about the impact it had on his gran. 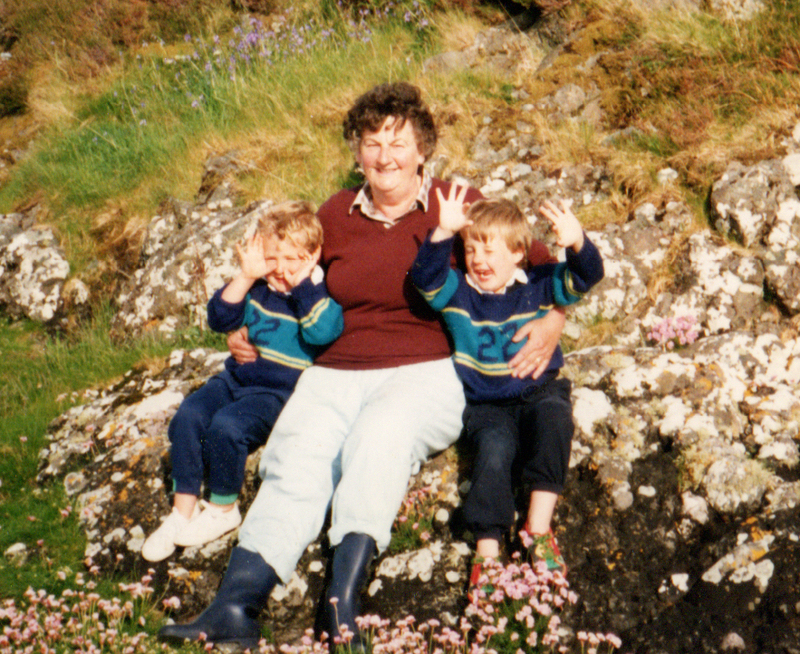 Hugh (pictured right) enjoys time with his gran Joan and his brother Iain during his childhood. Hugh said that his gran’s condition eventually got to the stage where she required full-time care. Highlighting the work undertaken by carers such as those who looked after his gran was a big part of his motivation for fundraising. “Part of the reason that I wanted to raise money for charity is that that they offer support services,” he said. “It’s not just for the people with the condition — it’s for the carers as well. The carers are amazing. What they do is really hard work and important work and they should be paid better. People have to give up jobs to care for family members. Any support they can get helps them get by and makes that burden a bit lighter. 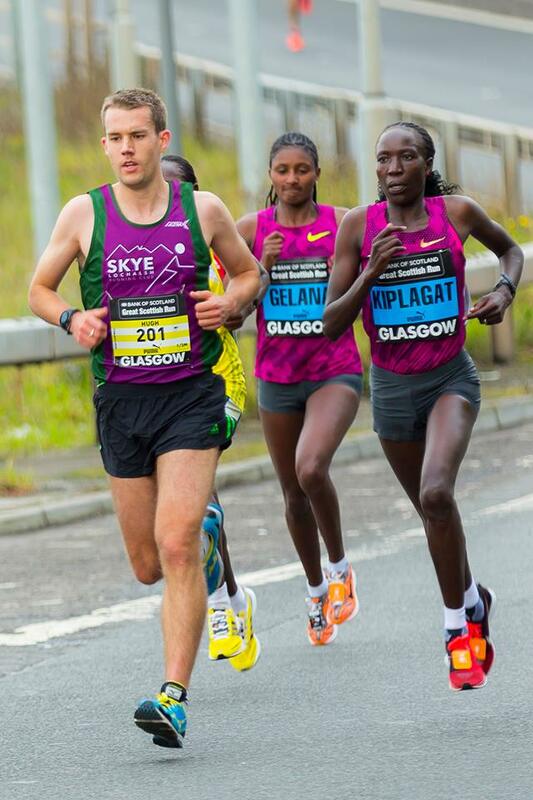 Hugh keeps pace with the women’s Olympic Marathon Champion Tiki Gelena and the women’s World Marathon Champion Edna Kiplagat during the 2014 Glasgow Half Marathon. Photo credit: Martin Gilmore. 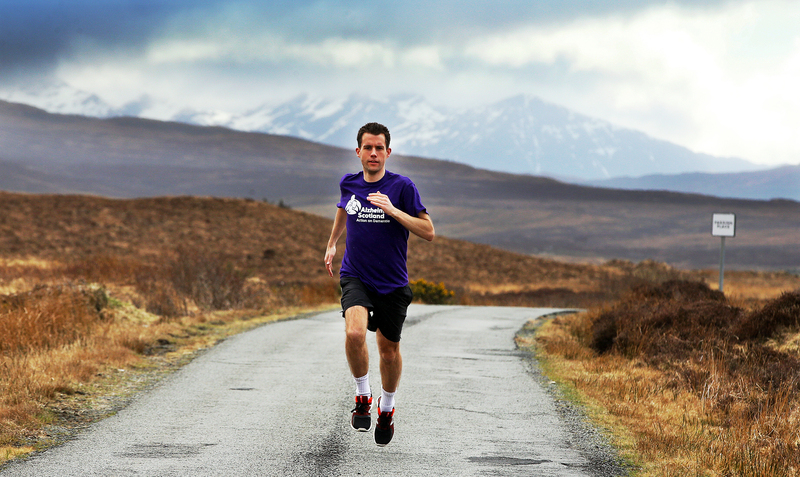 Although Hugh — who has won the Skye Half Marathon five times and is the course record-holder — was never able to share his running triumphs with his gran, he hopes that by raising awareness he will be able to play at least a small part in the battle against dementia. “I am doing this in memory of my grandmother because it’s unfortunate she never saw me become the runner I am,” he said. “People deal with grief in different ways, but this is how I deal with it — in a practical way. 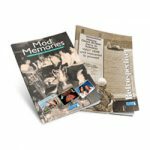 By doing this and helping the charity, it might, in some small way, make a bit of a difference for people with dementia. 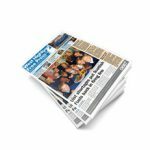 For more information about Alzheimer’s services in Skye and Lochalsh, contact Tigh na Drochaid on 01478 613450.